Hearing is something different from one’s self observation said, Kadiyam Srihari Dy. 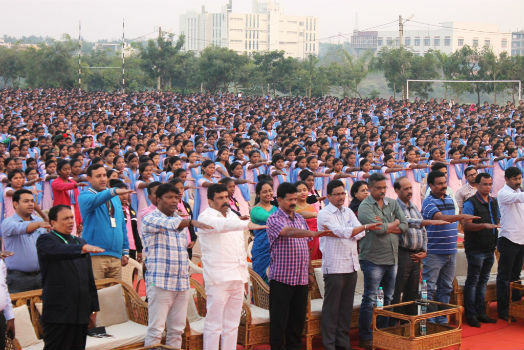 Chief Minister & Minister for Education, Government of Telangana while addressing 27,000 tribal students of Kalinga institute of Social Sciences (KISS) on Friday. 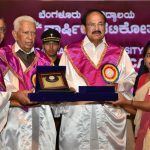 During the celebration of World AIDS Day Celebration he said, nowhere in the country any institutions like KISS with all the facilities are available in the campus for 27,000 poor tribal students. In our country there are so many big corporate houses companies, but they come forward to take the corporate social responsibilities by giving free education to the poorest of the poor children. But KISS has created an example for everyone by empowering a weaker section of society through education. They should learn from KISS. He also praised the effort and commitment of Dr. Achyuta Samanta, Founder, KISS for the empowerment of tribal community through education. The students are privileged and fortunate that, they have got opportunity to study in KISS. KISS has provided all the opportunities to shape your future. You should take the chance to utilize these opportunities. Addressing the gathering Bonthu Rammohan, Mayor, Hyderabad City said, KISS is the first of its kind, not only in India, but in entire world. I have never seen such a big institution like KISS in my life. The students of KISS are really blessed to study in this prestigious institution, he added. Shri Kadiyam owe the pledge to the students on World AIDS Day that, “Together we will defeat HIV/AIDS by empowering youth with knowledge about the disease and we also pledge a vow to give love to ones surviving it.” Dr. Achyuta Samanta, Founder, KIIT & KISS gave welcome address while Dr. P. K. Routray proposed vote of thanks and R. N. Dash, Secretary, KIIT & KISS presided over the function. Among others Smt. K. Vinaya Rani, wife of Shri Kadiyam; Prof. H K Satapathy, VC, KISS Deemed University; Julios Lakra, Registrar; Surjya Mohanty, COO, KISS and all the faculties, teachers and officials of KISS were also present.